Biotinylated Human BTLA (31-134), Fc Tag (BTA-H82F8) is expressed from human 293 cells (HEK293). It contains AA Lys 31 - Thr 134 (Accession # Q7Z6A9). The protein has a calculated MW of 40.5 kDa. The protein migrates as 55-66 kDa under reducing (R) condition (SDS-PAGE) due to glycosylation. 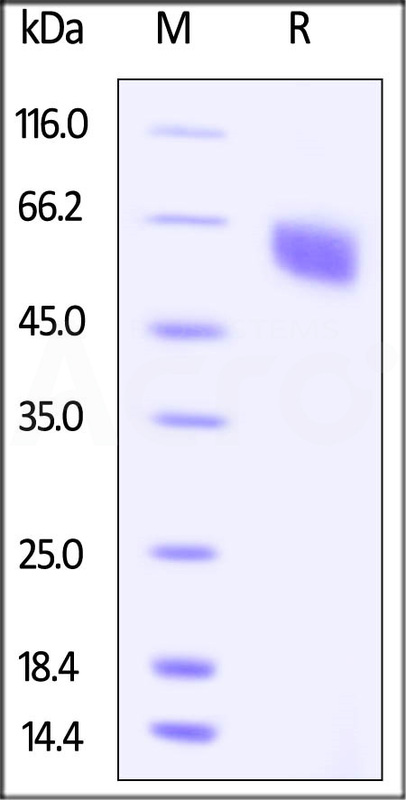 Biotinylated Human BTLA (31-134), Fc Tag on SDS-PAGE under reducing (R) condition. The gel was stained overnight with Coomassie Blue. The purity of the protein is greater than 95%. Immobilized Human HVEM, Fc Tag (Cat. No. 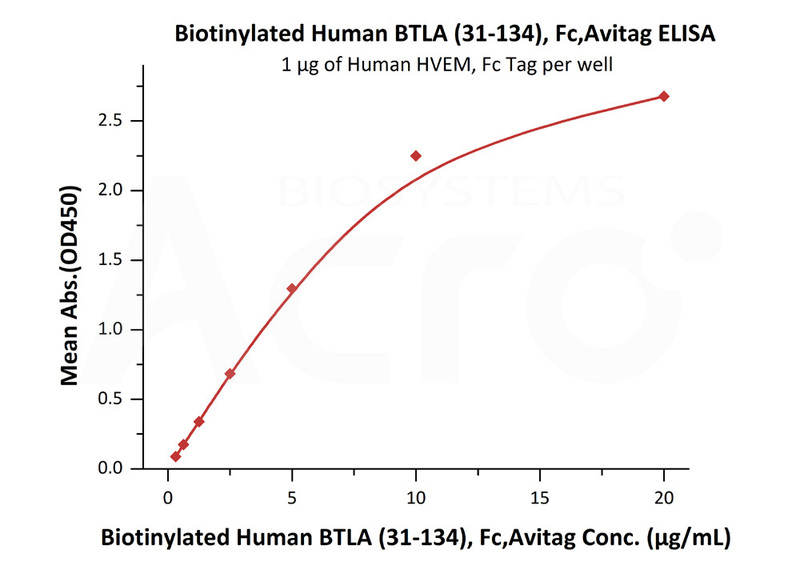 HVM-H5258) at 10 μg/mL (100 μL/well) can bind Biotinylated Human BTLA, Fc Tag (Cat. No. BTA-H82F8) with a linear range of 0.3-5 μg/mL (QC tested). B- and T-lymphocyte attenuator (BTLA) is also known as B- and T-lymphocyte-associated protein, CD antigen CD272. BTLA contains one Ig-like V-type (immunoglobulin-like) domain. As a lymphocyte inhibitory receptor, BTLA / CD272 inhibits lymphocytes during immune response. BTLA / CD272 can interact with tyrosine phosphatases PTPN6/SHP-1 and PTPN11/SHP-2, and interact with TNFRSF14/HVEM. (1) Watanabe N., et al., 2003, Nat. Immunol. 4:670-679. (2) Gavrieli M., et al., 2003, Biochem. Biophys. Res. Commun. 312:1236-1243. (3) Sedy J.R., et al., 2005, Nat. Immunol. 6:90-98.